The last time we heard from reader Joan Larsen, she was recovering from a disaster at sea. 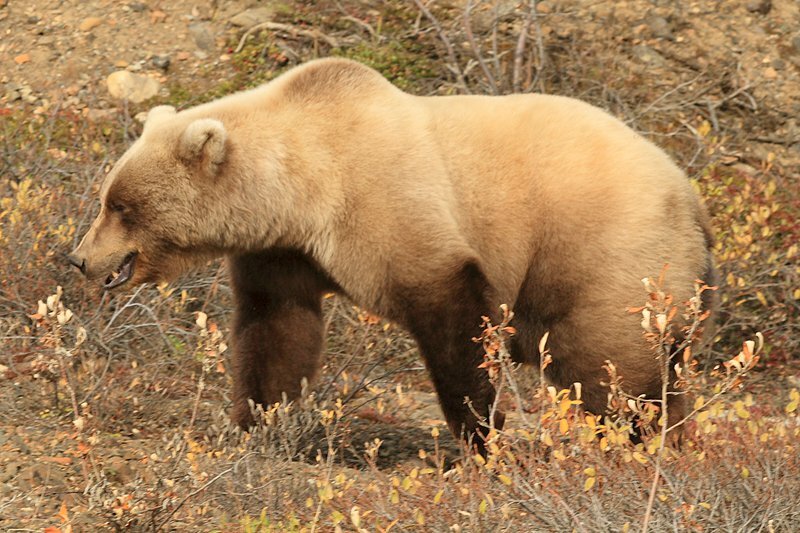 This time, she comes face-to-face with a grizzly in Denali National Park. Some people just can't travel gently. MOUNT McKINLEY, Alaska – High on an Alaskan mountainside, I was reveling in being alone. Just me and Mt. McKinley, the highest mountain in the United States, a stone's throw away. This was as close to heaven as I could get, I thought. Until a very large blonde grizzly bear strolled toward me, and it occurred to me that I could be eaten — and soon. And get even closer to heaven. Early that morning, the park ranger our family had hired to guide us up a steep mountain close to McKinley told us that, because there was no trail, the route would be "strenuous and steep." That was an understatement. I decided to call it quits and wait in this idyllic location until the group returned a few hours later. The guide reluctantly agreed. Much later through binoculars, I spotted my family on the mountaintop, wildly pointing for me to walk to the right. I figured they were trying to get photos of me with Mt. McKinley in the background. I stopped, waved, and posed. That's when the park guide ran down one level and screamed, "Go down, go down!" and cupped his hands behind his ears. BEAR, I thought. But though hillocks abounded, there was nothing in sight. Good, because I couldn't imagine bounding down a slope I had barely been able to climb up. And there, at the base, I ran into a majestic caribou with full antlers. I had obviously misunderstood: The guide had seen the caribou and didn't want me to miss it. I couldn't believe my good luck. As the caribou headed up the ridge that I had come from, I followed. He actually posed on the ridge before disappearing. As I debated following him higher, my eye caught a flash of blonde. THE GRIZZLY. My family had long gone, thinking I was now safe. Now it was only me and this enormous creature. I was in big trouble. Everyone going to Denali National Park gets the lecture on what to do if you encounter a grizzly, but as you listen to it, you imagine it's just fodder for cocktail party conversations once you get home. Which is to say I hadn't prepared for the real thing. A grizzly bear can run 35 miles per hour. If you run, he will. And you will be the meal. I continued to face the bear, careful not to look in his eyes, as that is considered a challenge and not one I wanted to make. As instructed, I raised my hands high over my head to let him know how big I was. That was bad advice: He was much bigger. He seemed to love my over-the-head move, sniffing in my direction, then standing on his hind legs to his full seven feet. I didn't have a prayer in this stand-off. We were 30 feet apart. Not far at all when a bear can run like the wind. You must never turn your back on a grizzly. Every time the bear would look at the ground, I slowly edged a foot downward on the slope of spongy tundra. The bear alternately watched me and grazed. I had no choice: I would take a step downward, never looking behind me for a foothold. I remained facing him, knowing I could easily tumble. What if another bear appeared below me? My chances were dim enough without that worry. Two hours of back-stepping down the mountain later, I spotted the road. And in that one instant, the bear had disappeared behind an outcropping. I was not yet safe. I later learned that the grizzly had moved upward toward the route my family and guide were descending. Now they were the ones with quick choices to make. The guide scouted precipices with my family spread in a line behind. My heart was in my mouth when I saw the route they were forced to climb down: It was a rock face. There was no choice. The bear was above them. Once we were all on solid ground, the guide ran toward me, hugging me, telling me that they had frantically been trying to warn me about the bear. He turned white at my own tale of me and the blonde grizzly. Never again, he said, would he leave anyone alone. My grizzly bear encounter subsequently became the warning story all visitors remember, given by rangers on all the Denali National Park buses: Never, never wander alone in bear country.